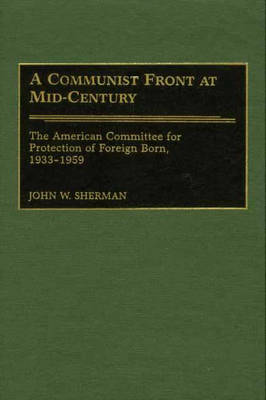 The American Committee for the Protection of Foreign Born played a major role in legal matters pertaining to deportation, naturalization, and immigration. This study provides the first thorough examination of its work, from the Depression decade of the 1930s, when the committee defended prominent labor activists such as Harry Bridges, through the war years and into the 1950s, when it served as a legal bulwark for the Communist Party. In 1955 the ACPFB itself became a defendant-as the pilot case before the Subversive Activities Control Board. Cautious and rational, the Board reached the correct conclusion that the organization was a Communist Party front. Indeed, in its fidelity to American communism, the ACPFB pursued a political agenda that often violated its stated mandate. It not only failed to protect Japanese-Americans during World War II, but it actually supported their internment. During the closing years of the war, it attempted to influence ethnic communities for the benefit of the Communist Party. False agendas, undemocratic internal controls, and duplicity drove liberal sympathizers away from the ACPFB by the early 1950s, when the pressures of the second Red Scare threatened both it and its host. The story of the ACPFB ultimately sheds new light on the nature of American communism itself-demonstrating anew its nature as a political movement in pursuit of power.